If we told you it’s imaginable to become a master at styling your wedding outfits with the perfect jewellery, would you believe us? Ladies, it’s no secret that we are incurable fashion enthusiasts and believe in just putting our mood swings to good use (don’t they affect everything we pick?). The quandary of what to purchase never fails to leave us puzzled. The story of every bride out there, isn’t it? Jewellery automatically forms an important part of your wedding attire and it can make or break your whole bridal look for the day. Don’t stress out, just make sure the jewellery you choose compliments your outfit beautifully. Well, let’s get ready to amplify your accessorising confidence with a few tips! Since Indian weddings include so many functions right from engagement, sangeet, haldi to reception parties, make sure you never repeat the same jewellery for different occasions. Your wedding day is one of the most important days of your life and repeating the same jewellery for multiple occasions just takes away the charm. Also, you need to understand that the same statement pieces will just kill the look entirely. Before you go for jewellery shopping with family or friends, make sure you’ve decided on your wedding outfit. The jewellery worn on a saree will be totally different from the one you will wear with a lehenga or an anarkali. The kind of choli you pick should also be kept in mind while finalising your jewellery. For example, if your choli has some heavy work done on it, then it is ideal you keep your wedding jewellery simple. On the other hand, if your outfit is simple then accessorising it with heavy pieces would spruce up the look. Just like trends in clothing, jewellery designs also keep evolving constantly. Make sure you choose something that goes perfectly with your wedding attire. If you feel the kind of jewellery you’re looking for doesn’t match your outfit, then you can probably opt for customisation to keep the selection process uncomplicated. At times, you don’t always have to wear the same colour jewellery to match your outfit. Sometimes, you can mix and match it with an outfit and voila! You have got the perfect recipe for something unique and eye-catching. There are jewellers who design according to your wedding outfit, no matter how exquisite or simple your outfit is. So, it is crucial to choose the right jeweller. 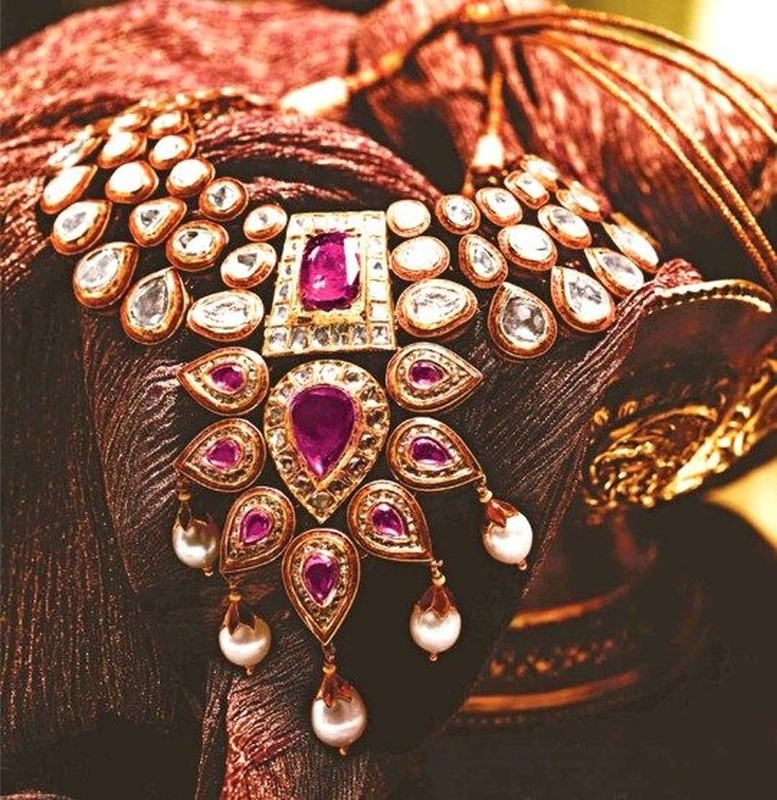 There are times when just a quick look at the bridal jewellery is enough to make you go gaga over it! Sometimes, you’ve seen the same jewellery design somewhere before. This tends to happen because a lot of brides copy ideas from weddings they had previously attended. A lot of women leave the jewellery shopping to their mother or siblings. Jewellery should reflect your personality and your body shape and complexion needs to be considered as well. Hence, all of these factors should be kept in mind before a woman plans on doing her jewellery shopping. We always recommend noise-free jewellery as you don’t want them to add to the existing chaos of your band baaja baraat. There are countless styling options that might land up confusing you. The trick is to discover which pieces will add the finishing touches to your outfit.